Kathy from Just Crafty Enough says she thought it would be until pigs flew that she would win a ribbon for knitting at the Minnesota State Fair. And pigs did fly, in a sense, on her red-ribbon-winning Knit Flying Pig Mittens, which she has supplied the pattern for on her blog. 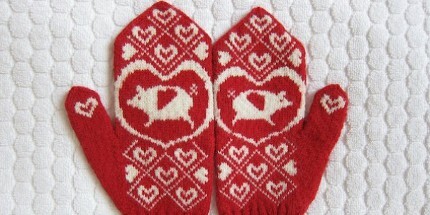 The mittens use traditional Scandinavian heart motifs and completely untraditional pig motifs, along with a cute little hemmed picot edge for extra adorableness. There are even little hearts on the thumbs, which may be my favorite part of all. Kudos, Kathy, and thanks for sharing!